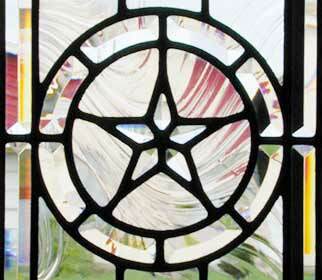 Texas Star V Leaded Glass Vertical Beveled Sidelight Window Custom Glass Design. "TEXSTARV" CUSTOM TEXAS STAR LEADED GLASS BEVELED SIDELIGHT WINDOW CUSTOM AT GLASS BY DESIGN. The star, ring, and inner border were beveled. The background was Baroque glass with a border of Flemish glass.